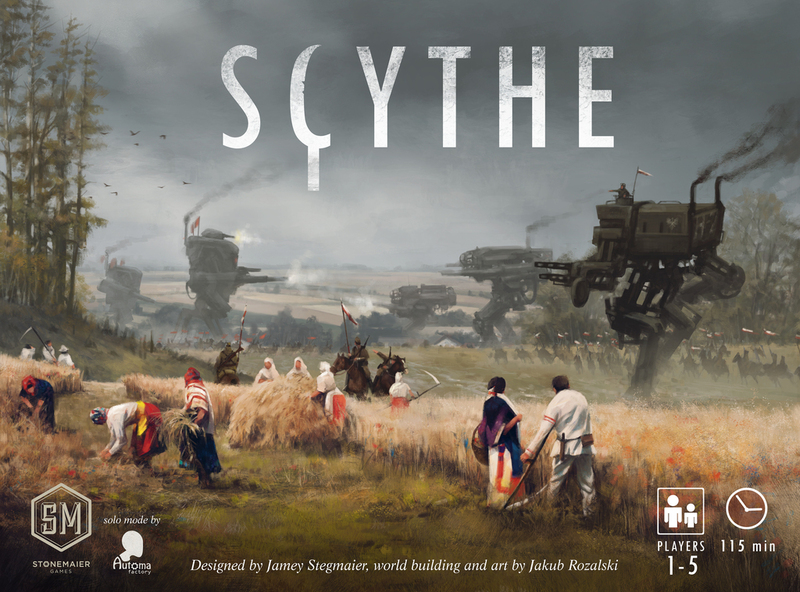 16 the game I read and heard most about was Scythe. Designed by Jamey Stegmaier. It got a lot of attention and was at the top of quite a few best games of 2016 lists. So I was glad when someone in my game group received his kickstarter edition and we got to play it. Let’s see if it deserves the hype. Is it an economic engine game? A worker placement game? A war game? An exploration game? In truth, it’s all of the above, which makes this a unique experience. Set in a weird alternate eastern europe 1920 reality, where farming, mechs and barren wastelands mesh into an extraordinary backdrop for a game. 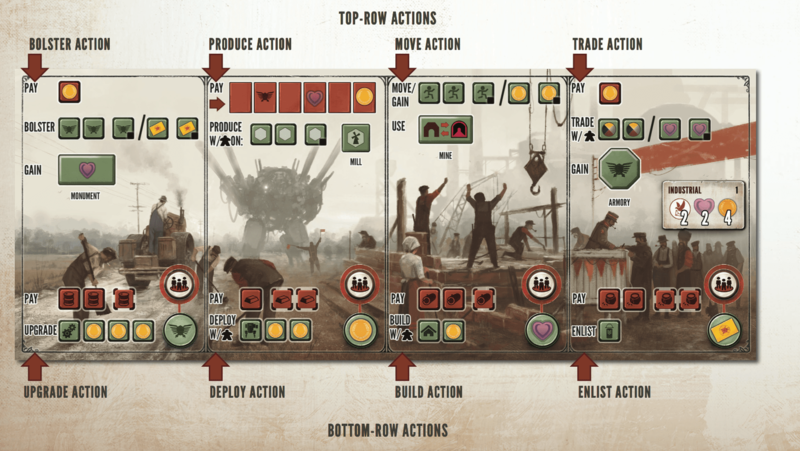 Every player plays a faction, which has a special power and two player boards. These player boards are the heart of the game where you select your actions for the turn. You always pick a top-row action and if possible you may also perform the corresponding bottom-row action. Players start at their home base located at the edge of the board with a couple of workers and expand from there. You can obtain resources (oil, food and metal and wood) by using the produce or trade actions. You need these to pay for upgrading your player board, deploying mechs, building structures and the enlist action. There are a lot of moving parts, even though the turns go fast. Because the tempo of the game turns you always have the feeling you are involved in the game, even in your opponent’s turns. The winner of the game is the player who has the most money the moment the game ends. The end game trigger is rather unique, because the game ends when one player has achieved 6 goals. These goals are all very different and force players to diversify. These goals vary from owning 4 Mechs, building all structures, having 16 power on the power track etc. Players earn money throughout the game and at the end of it they get extra for area control, goals fulfilled and for their resources based on their popularity. And there is more, secret objectives, encounters and battle. It’s easy to feel overwhelmed by the game, but in its core Scythe is not a very complex game. There are just so many moving parts. Interaction between players is present, but is limited to battle for areas and recruitment bonuses. Talking about battle, looking at the artwork and the mech miniatures the game could easily be mistaken for a war game. But it is not. Battle is a minor affair and although goals can be achieved through battle, it is never the core of the game. I am impressed. This game manages to combine a lot of game elements like worker placement, area control and creating an economic engine all into one, while maintaining smooth gameplay. Some of our first games did take 2,5 hours to complete, but after some experience the 115 minutes, which it says on the box, is reasonable. I especially liked the different ways I could upgrade my movement and the encounters. The encounters are a bit random, but give a very nice addition to the feel what world you are playing in. What I didn’t like is the feeling of confinement in the beginning of the game. You are kind of trapped in your base until you develop a way to cross the river or lake that prevents you from expanding into the lands. Sometimes the resources you desperately need to efficiently cross the river are on the other side of the river. Hopefully this will be addressed by the airships that are coming in the upcoming expansion Scythe: The Wind Gambit. Although it takes some time to learn the game, I wouldn’t say it is a very complex game. It comes with a very well written rulebook which will answer every question that might arise. It’s not the same as playing the game, but from what i have seen during the live play (DT) it seemed too economic to me. They were constantly upgrading upgrading upgrading, but that didn’t seem exciting or seemed to not change much (watching from the side). I guess most of the game happens on your player board. A lot of the playing happens on your player board, but unless you totally avoid the other players (which I do not advise), you will be interacting with them in battles, etc. You can play a bit of a cat and mouse game, but interaction on the board almost always happens.